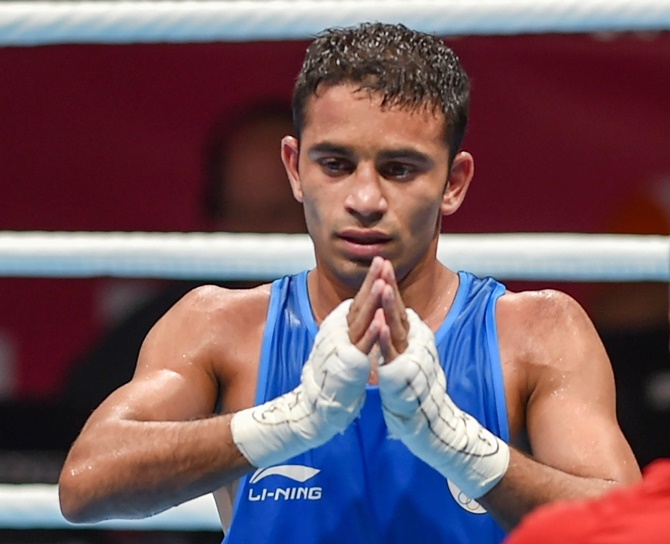 Amit Panghal (49kg) scored a stunning tactical victory over reigning Olympic and Asian champion Hasanboy Dusmatov on Saturday to become only the eighth Indian boxer to claim a gold medal at the Asian Games. The 22-year-old armyman, the only Indian to make the finals, prevailed 3-2 against the fancied Dusmatov, who had beaten him in a split verdict in the quarter-finals of last year's World Championships in Hamburg. The Uzbek was also voted the best male boxer at the Rio Olympics in 2016, where he clinched the gold in the light-flyweight category. Amit, making his debut at the Games, showed immense tactical brilliance, especially in defence to outwit the Uzbek. In Saturday's gold medal bout, the Haryana boxer kept his range and struck some clean right hooks and jabs on his shorter and slightly edgy opponent. The Uzbek southpaw, known for his brilliant counter-attack, seemed wary of the constantly-on-the-move Indian, who refused to fall into the trap of diving in. The result was a frustrated Dusmatov being forced to lunge forward, which worked perfectly well for the Indian in his counter-attacking game. This win marks the highest point in Amit's meteoric rise to the top, starting with an Asian Championships bronze last year. A World quarter-finalist, he claimed a silver in the Commonwealth Games. Earlier this year he also won gold medals at the inaugural India Open and the prestigious Strandja memorial in Bulgaria. Vijender Singh and Vikas Krishan were the last set of male gold medallists for India at the Asian Games. They won the yellow metal in the 2010 Guangzhou edition. Vikas (75kg) settled for a bronze this time. In the 2014 Games, M C Mary Kom was India's lone gold medallist.